For those who don't know, 'BlueStacks' is just like an Android simulator where you can run all your Android apps right on your PC. Many of us will be familiar with it as we use the same software for installing 'Whatsapp On PC'. 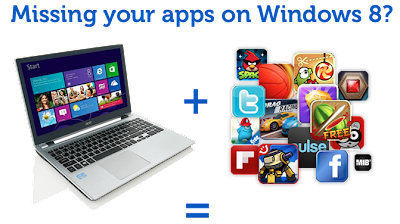 Now, the good news is that BlueStacks has been released, or one can say optimized, for Windows 8. All the android action is now back on your PC. Users carrying Windows Phone or iOS can now easily enjoy almost all Android apps right on their PC. With 'almost' I mean it's right now filled with only 750,000 mobile apps but that's more than enough.. Right?? You can download Bluestacks via link below. Excellent information.Really it is good news.Thank you so much for share this great information.